First a quick, printable introduction. Studies is a series of tutorials for creating scripts. Hold K1 for three seconds. Be still, and norns will awaken. There’s a small light near the power plug. ORANGE means power. WHITE means disk access. On the bottom of the norns there is a tiny push switch that will hard power-off the device. For general shut down use the sleep menu function. This fully turns off the norns with a proper software shutdown. Use the bottom switch only if something in software went wrong. A changing melody will play. E1 changes the mode. K1+? means hold K1 then push ?. E2 navigates position, E3 changes position. K2 toggles the sequence to edit. K1+K2 clears all steps. K3 morphs the current sequence. K1+K3 randomizes. K2 resets to play to zero. K3 jumps to random position. E2/E3 adjust selected parameter. K2/K3 move selector. E2 adjusts BPM. K1+E2 change division. E3 changes root note. K1+E3 selects scale. Tap K1 quickly to toggle between PLAY and OTHER. You are now at HOME. At HOME press K2 to toggle additional system information display. Explore the collection of scripts. Selecting a script will show a description. Forward again will run the script. The play screen will return upon running. Quickly tap K1 to toggle between PLAY and OTHER. AUDIO - Like the parameter list, but for the global audio settings. Includes output and input levels, headphone gain, aux send (reverb), and insert (compression). See the AUDIO section below for details on the parameters available. DEVICES - This is a list of connected USB hardware with their associated port number. Most scripts address port 1. See norns study 4 for a scripting guide to multiple ports. This section lets you re-assign connected devices to specific ports. WIFI - Networking settings. Requires USB WIFI interface. See CONNECT. UPDATE - Checks for updates. Internet connection required. See UPDATE. RESET - Quickly resets the audio system. Powers down cleanly, saving current state. Scripts can define their own parameters. Note that some scripts may have no parameters. E3 changes values. Hold K3 for fine tuning. E3 scrolls set number (0 is default, with 1-99 available). K2 loads the selected set. K3 saves the set to the selected position. Enable MIDI-mapping with E3 while the MIDI-map item is selected. Release K1 to return to the Parameter list, but now you see MIDI CC assignments. Push K3 to enable MIDI-learn, whereupon the next incoming MIDI CC will be mapped to this value. Get out of MIDI-mapping mode by holding K1 and toggling off. On this page you can record and play directly to and from disk. K2 toggles focus between REC and PLAY. Mixing and VU display happens here. K2/K3 to change selection, which is highlighted. E2/E3 modify the respective highlighted levels. Control of various audio parameters happens in SYSTEM > AUDIO. Note that the topmost levels are also controlled via the LEVELS page. Scripts can be created and edited using a web browser when norns is connected to a network. These scripts will appear in the SELECT list for later play. The WIFI nub must be inserted before starting. Navigate to SYSTEM > WIFI. Choose your network from the list displayed. Enter the password. E2 toggle between top and bottom row, E3 scrolls character, K3 selects character. Select OK when complete. With success, you should be assigned an IP address shortly after. maiden is the web-based editor for norns. Point your web browser at norns.local to see the maiden interface. If the site is not found, try connecting directly to the IP address shown on the norns screen, for example: 192.168.1.30. The interface is arranged into a left sidebar FILE navigator and a right split editor, where the top is the EDITOR and the bottom is the REPL (read-eval-print-loop). This panel lets you select the text you’re editing in EDITOR. There are top bar icons for various actions: New, Delete, Duplicate, New Folder, and Rename. This is where you can edit the selected script. To the right there is a bar with two icons: disk is SAVE and PLAY will run the current script. 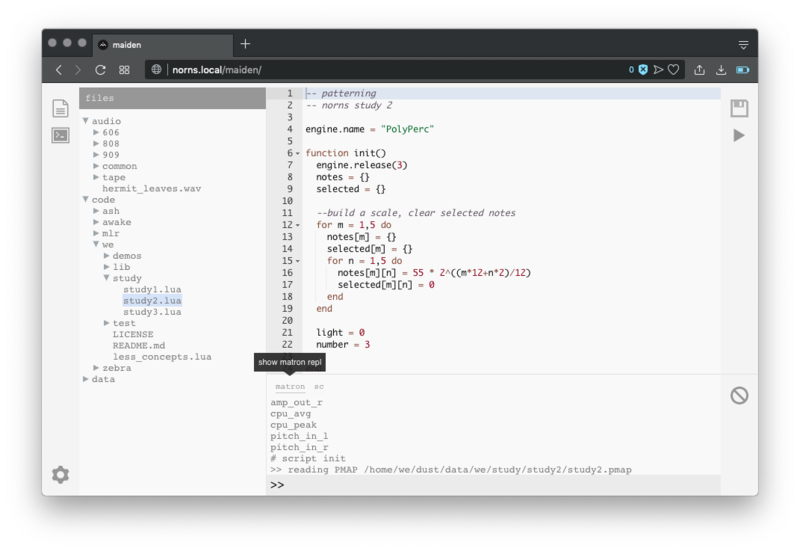 The editor can be configured for various modes (default, vim, emacs) in addition to tab size and light/dark mode. Click the gear icon at the bottom left of the screen. Messages are printed in the bottom panel. There are two tabs: matron is the main lua environment, and sc is supercollider which is the engine environment. will display the expected message in the window above. The clear icon to the right will clear the current messages. This will disconnect maiden, but once matron has restarted you can reconnect. The bottom left ? icon can be used to navigate to the onboard programming reference. You can manually open the API reference at norns.local/doc. Also see the general reference. You can delete and rename files via maiden. But you’ll need to copy files between your computer and norns. File management is best achieved via SFTP, so you’ll need to first connect norns to your laptop via WIFI. Use an SFTP client (such as Cyberduck) to connect to the IP address shown on the norns screen. See this guide for further details. Upon logging in you’ll be in the home folder which is /home/we/. If you want to make a backup of your scripts, psets or other data simply make a copy of the dust directory in /home/we via SFTP. Restoring from this backup is as simple as copying this directory from your computer back to the /home/we/dust directory on norns. When connected via WIFI you can SSH into norns at the IP address shown in SYSTEM. Where (tab) appears hit TAB to autocomplete the serial number. Login is the same as above. Browse the Library to see projects created and contributed by various people. These project pages have information and a download link. Download a file, unpack into a folder, and then move this folder over to the dust/code/ folder using SFTP. It’ll show up in the SELECT list. The norns ecosystem was created with community as a focus. The exchange of ideas leads to new ideas. Create a new thread in the Library. You’ll be able to attach a .zip file containing your project folder. That last line is a link back to the thread number. There’s a chicken-egg situation with starting a thread and uploading the project, so you may want to edit and upload your project just after creating a thread. Alternatively you can host your project as a github repository by simply cloning your project into the dust/code/ folder. We’re working on infrastructure to integrate more closely with git, but in the meantime we suggest using ssh to manage this. In the project thread you can then link to a master download or most recent release. Updates to the core norns software can be installed easily via the SYSTEM menu. You must first be connected to the internet via wifi and have at least 400M free disk space. If a new version is available you will be prompted to continue installing. Audio will be disabled during this time. Note that the download time may be a few minutes, have patience. Upon completion you’ll be notified of success or failure, then the unit will shut down after confirmation. If you are running 181101 or earlier you’ll need to first upgrade to 190405 using the old system. Insert the disk to norns and power up. 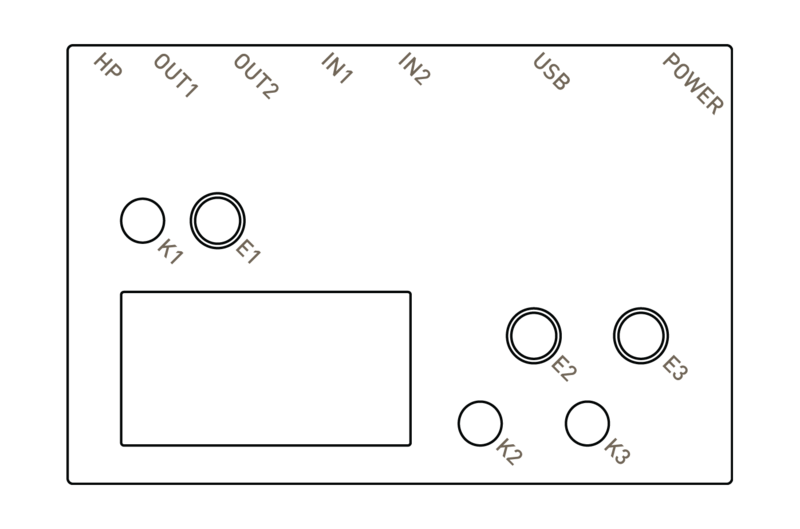 Connect via serial (see instructions above). Upon completion type sudo shutdown now to shut down. If norns shows ERROR: AUDIO ENGINE chances are there’s a problem with duplicate SuperCollider classes. To solves this connect via wifi and open maiden. Go to the SuperCollider REPL tab, type ;restart and press enter. ERROR: There is a discrepancy. Remove one of the offending scripts/classes and either completely restart norns or execute ;restart again from maiden and all should be good again. The community forum has various informative threads. Please join us! Check the known bugs list for problems and solutions. If you’re experiencing hardware problems contact info@monome.org and we can help right away. Norns is the result of generous contributions by many people, and the ecosystem continues to evolve. We welcome discussion and code to help further the goal of an open, dynamic instrument creation platform. Check out the github repo. We’re also always looking for help with documentation, if your skills include design, instruction, or proofreading. Collective efforts have created numerous exceptional projects over the years, and there’s more to a project than just code! Found a bug? Let us know. Please file a github issue or let us know on lines. This project would not have been possible without linux. Currently we’re using Supercollider for DSP extensibility. matron (control system) and crone (audio system) were created by @catfact. maiden (editor) was created by @ngwese. Each grew with contributions from @artfwo, @jah, @simon, @rv, @pq, @markwheeler, and many others. norns was initiated by @tehn (monome).